StoreWALL Heavy Duty - The Ultimate Slatwall Wall Panel! Buy/Price storeWALL Slatwall Wall Panels Now! Garage Storage and Garage Organization panels designed for tough applications. When you solve your home storage and garage organization with storeWALL, you can be confident that your solution can add real value to your home. StoreWALL’s core is solid - much stronger than conventional pegboard and Slatwall. Plus, storeWALL is resistant to nicks, scratches and chipping. Available in two sizes: 8' x 15" and 4' x 15" for design versatility. L-Shape Slots are more attractive and designed to accept most standard wall accessories. StoreWALL Heavy Duty panels are designed for tough organization applications and are available in all 5 classic storeWALL colors in an exclusive matte finish. The Heavy Duty panels can install with the exclusive storeWALL "InstallStrip" hidden fastener system for design flexibility. StoreWALL Heavy Duty is the ultimate solution for home organization and storage. StoreWALL is industrial quality for heavy duty organization and rough use areas . . . just like your garage. For complete technical specifications scroll to the bottom of this page. 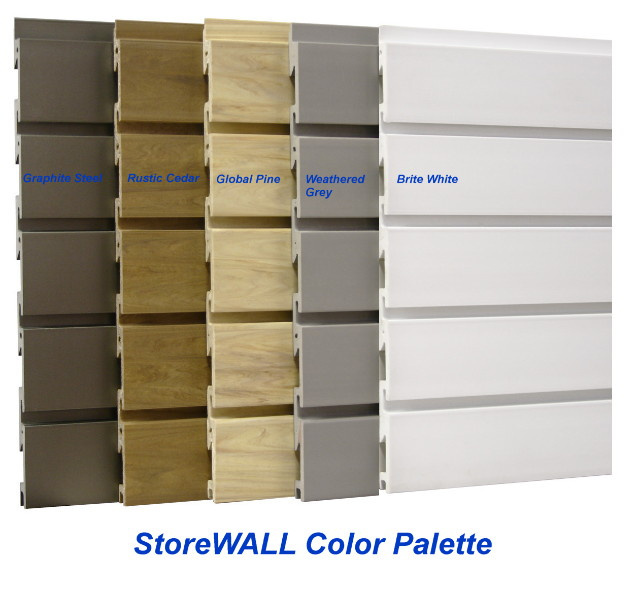 StoreWALL offers 5 different colors - Brite White, Graphite Steel, Weathered Grey, Global Pine and Rustic Cedar. Colors and grains are throughout the panel - we call it solid core. There are no coatings, paints or laminates to damage - no nicks, chips or scratches. StoreWALL remains attractive and versatile for years to come. The Heavy Duty panels are designed for various applications, to satisfy your tastes and needs, and are available in all 5 classic storeWALL colors in an exclusive matte finish. Our craftsmen create the wood grain panels - they are like Mother Nature in a high tech factory. They are so real we have to convince wood workers that storeWALL is a plastic extrusion. The home storage system was intended for use in tough, high abuse areas . . . just like your garage. The high strength storeWALL vinyl garage storage panels are waterproof, durable and versatile. And, they are beautiful. When you create with storeWALL, you can be confident that your garage will add value to your home. You can install storeWALL indoors, outdoors, at the seashore or in a green house. The storeWALL panels are suitable for all climates and conditions. Waterproof and stain proof. The L slot shape will not collect water or dust so there is no support for mildew - mildew proof. StoreWALL can be cleaned simply with water and for difficult stains use industrial cleansers or disinfect with bleach. A single strip, a whole wall, or for anything in-between StoreWALL can be installed to meet your organization needs and design choice. The storeWALL tongue and groove design adds strength and is hidden - no horizontal joints to show. The InstallStrip option hides screws - no fasteners. Very attractive! Installation is like wood products. Use standard wood working tools to cut, drill and route. StoreWALL is easy to work with. Choose from 5 different styles; 3 designer solid colors and 2 wood grains. And you can rest assured . . . storeWALL panels are designed to accept all standard wall accessories. Now you really can have an organized garage . . . garage storage with a place for everything from garden tools to sports equipment. StoreWALL is an industrial grade, tin base PVC vinyl. It is a class 4 recyclable plastic. StoreWALL has a 10 year limited warranty. Garden spades to baseball bats – cabinets to canoes - garage organization must be versatile. You can use 1000s of accessories from 100s of manufacturers that make organization accessories for your home and display products for showrooms. More accessories fit storeWALL than any alternative home storage system. You can change and move accessories in no time at all. The storeWALL finish and lightly sanded edges add a distinct, high quality appearance. Only the best extrusion craftsmen can master these details. Custom matched trim and screws also contribute to the strategic design of the wall panel system and are available in all 5 storeWALL colors. The storeWALL tongue and groove design adds strength and is hidden, no joint feature, creates a high quality installation. "L" slot: does not trap dirt. Standard slot size ensures that a wide range of accessories are available. "T" slot: traps dirt. Non-standard dimensions. Only Gladiator accessories can be used. "L" slot: does not trap dirt. Standard slot size ensures that wide range of accessories are available. Color-matched screws available. Hidden Fastener option. Installed by GarageTek personnel only. Choose from 1000's of standard accessories from a variety of manufacturers. Limited choice. Approximately 30 items. Limited choice. Approximately 36 items. Compare strength. Compare installation options. You can feel the quality of the panels; see the quality in the fit and finish. The storeWALL Heavy Duty home storage panel system was designed and engineered to be the finest, most versatile home storage and organization product on the market. The storeWALL system was designed for use in tough, high abuse areas . . . just like your garage. The high strength storeWALL extruded vinyl home organization storage panels are waterproof, durable and versatile. And, they are beautiful. When you create your new garage with storeWALL garage organization panels, you can be confident that your design will add value to your home. And when you choose storeWALL Heavy Duty for your garage organization, you can choose from 5 different panel styles; 3 designer solid colors and 2 "almost real" wood grains. And you can rest assured . . . storeWALL home organization panels are designed to accept all standard wall accessories. You will never be limited to any one specific manufacturer. Now you really can have an organized garage . . . a place for everything from garden tools to sports equipment. a versatile, organized, attractive, 'easy to care for' garage . . .
a welcome addition to the way we live today. Is storeWALL hard to get? We stock storeWALL Slatwall in wood grains and solid colors. Orders, out of warehouse, usually ship within 48 hours. StoreWALL Slatwall was designed for ease of handling, installation and shipping. Weight is less than half conventional Medium Density Fiberboard products. This makes storeWALL Slatwall easy to ship anywhere in the world. Visit our Online Store StoreWALL Slatwall section or browse below for shipping weights and carton information. What are storeWALL panels made from? StoreWALL Slatwall wall paneling is an attractive, solid core, closed cell polymer extrusion. The engineered panel is a polyvinyl that is resistant to sunlight, is static resistant and flame resistant. It requires modern technologies to create a storage panel system that is tough enough for a factory tool room and attractive enough for a corporate board room. Where can I use storeWALL Slatwall panels? StoreWALL Slatwall wall panels are the ideal design solution for any storage, organization or display problem. StoreWALL Slatwall solves problems in the office, garage, basement, laundry room, closet, pantry, etc. It is completely waterproof so it can even be used outside! We have a complete range of accessories: pegs, hooks, shelves, baskets, brochure holders and specialty components. Browse our online store for more information. In addition, just about any existing Slatwall or 1/4" peg board accessory will fit storeWALL! Other Slatwall makers "key" their slots to a unique pattern which forces you to buy all accessories from them. StoreWALL Slatwall has the universal key which allows you the widest choice of accessories! StoreWALL Slatwall wall panels can be mounted to a wall as a temporary, changeable or permanent installation. StoreWALL Slatwall can be installed over existing walls, on concrete block or bare studs in new construction. Installations have been made on curved walls. StoreWALL Slatwall can be adapted to existing panel systems for offices or wall systems for modular construction. Check out our Installation page for step by step instructions! How easy are storeWALL panels to install? StoreWALL Slatwall panels can be easily installed by one person. An 8' long x 15" high storeWALL Slatwall panel is only 16 pounds. It is easy to transport to the site and convenient to install. "InstallSTRIPS" are storeWALL's hidden fastener system. Use InstallSTRIPS to position a single panel or lay out an entire wall. Use these for quick change out of panel Color for commercial applications or for an architectural feature where mounting screws are not used on the panel surface. See http://www.youtube.com/storewall for a short video demonstration. Common hand and power tools are all that's necessary for a professional installation. Any fabrication technique used with solid wood can be used with storeWALL Slatwall. StoreWALL Slatwall wall panels can be drilled, cut, routed or shaped just like wood. It can be sanded, nailed, screwed and glued. It does not dull tools like MDF. How tough are these storeWALL panels? The storeWALL Slatwall material was engineered to be strong, tough and durable. It is not affected by water, dirt, dust or harsh environments. StoreWALL Slatwall is stain resistant. Wood grains and colors are solid core, an integral part of the material. This makes scratches, dings and gouges almost impossible to see. What would I need to do to maintain/clean my storeWALL panels? Easy! StoreWALL Slatwall comes clean with a damp cloth and can be washed using any commercially available cleaner. It can be disinfected with household bleach (great for laboratory and medical applications). 'Permanent' markers come off with lacquer thinner. Small scratches disappear with an acetone (nail polish remover) wipe. Stubborn blemishes or discolorations can be sanded, steel-wooled or polished to match the rest of the panel. Instant and invisible repairs (if ever needed) are accomplished with "super-glue" leaving the panel as strong as before. Can I use storeWALL panels outside? StoreWALL Slatwall wall panels are weather proof. It is not affected by water, dirt or dust. StoreWALL Slatwall panels resist the effects of sunlight and are UV resistant. StoreWALL Slatwall can be used in fresh and salt water environments. StoreWALL Slatwall opens a whole new world of storage and display! Can the storeWALL Slatwall panels be re-used? StoreWALL Slatwall is an extremely durable, solid core material that will keep looking good for years. If you move, simply unscrew the panel from the wall and take it with you. To avoid all this screwing around, use the flexibility of the storeWALL Slatwall InstallStrip system which makes creating seasonal display, moving exhibits or changing background colors a quick, simple, one person operation. StoreWALL Slatwall is ideal for growing businesses or families. Is storeWALL Slatwall good for the planet? Yes. StoreWALL Slatwall wall panels are completely recyclable and environmentally friendly. StoreWALL Slatwall is not a wood based product. What are the stock storeWALL individual panel sizes? An individual storeWALL Slatwall wall panel is 15" high and available in 4 foot and 8 foot lengths. Panels are 11/16" thick. An 8' heavy duty panel covers 10 square feet and weighs 16 pounds. A 4' heavy duty panel covers 5 square feet and weighs 8 pounds. Use the "ask a question link" at the top of this page or you may also call or email us! 49.5" x 16" x 4.375"
97.5" x 16" x 3.375"
ANSI, ISO or ASTM protocols and standards.